If you have been following this blog for a while, you might have noticed that I have been having problems with book two of the Byrhtnoth Chronicles. In the first place I didn’t intend to write a series. 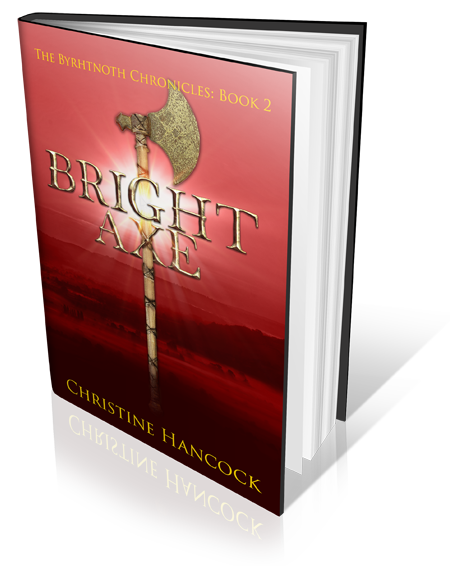 Bright Sword emerged from a writing course, it grew and by the time I finished it, I knew there was more of Byrhtnoth’s story to tell – He had a long life and he was still in his teens. Book two came easily, I enjoyed writing it. I tidied it up and sent it to a couple of brave volunteers for a Beta read. I was told it was better than the first book I was pleased, Bright Sword had been published in a bit of a rush, and was not entirely happy with it. The Beta readers made various comments, on different parts of book two. Meanwhile I had started book three. I say started but in fact I began in the middle – an experiment in POV. I forced myself to stop at what I thought was the end and went back to the start. But where was the start? Book two had continued directly from the end of Bright Sword, but for some reason I couldn’t get it to work properly this time. I carried on writing, from a later “beginning” and have nearly finished the first draft, joining the two halves together. I have continued to worry about the beginning: Steal the end of book two for the start of book three? Ignore what happened between books two and three and start later? But that bit of plot was vital! What I needed was someone to tell me what to do. An Editor. I was wary. I had already had problems with an editor. Where did I find the right one? Someone was recommended – they were too busy writing their own books. Someone else was mentioned, but another person said they were expensive. Time passed and I became desperate. Then I found someone. I won’t say who or how, in case it all goes pear-shaped, but I think it is going well. I sent off my manuscript, together with synopses of Books one, three (so far) and four (ideas) and a list of what was troubling me. I wanted a basic Editors Report. What I got was fantastic; it addressed every point I had raised, in detail. It told me what was good (thank you) and what was wrong (help). Horrible as some of the suggestions were, this favorite scene had to go (too much like something in book one) and that was too unbelievable, I knew they were right. I took a deep breath and thought about it, for several days. If I take that bit out, what do I put in its place? Yes, I can shorten/lengthen that piece. That scene is just waiting to be filled out. I came up with a new outline. It is better but there are problems – I still can’t work out where it ends! The Editor has ideas, so I have signed up for a full Structural Report. I’ll report later on how it goes. I have now recovered from that tornado of emotion – fear and elation. It is as if I had finished a large jigsaw puzzle. Every piece was in place, but the picture was wrong. Someone has taken the puzzle and thrown it up in the air. Where will it come down and in how many pieces? All I know is that it needed to be done and I will lean a lot from putting it together again. Wish me luck. Another good thing that came out of this shake up. Despite, or because of, spending all that time thinking, I still managed 6290 words of book three this week. All that’s left to do is the final (middle) scene – the battle. I feel I have just been through one, which may be a help. I’ll let you know next week. ← Where do you get your ideas?